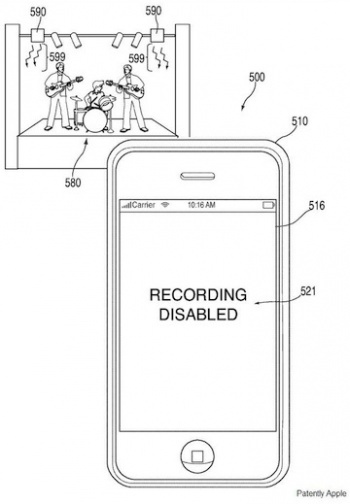 Your iPhone might soon detect whether you are recording that concert and shut itself off. Piracy is a bad thing. We all know that, right? Right? But I'm also not a big fan of corporations taking away the rights of consumers to use their products in ways the designers might not have intended. Apple is patenting technology which will add the ability for future iterations of the iPhone to automatically detect whether the user is capturing video of a musical performance or a film presentation and disable the camera. The technology involved is somewhat ingenious. Movie theaters, for example, already use infrared signals broadcasting to individual hearing-aid devices and Apple intends for future iPhones to detect these signals, clueing the device into the fact that its user is watching a film. If you decide to take out your iPhone and perhaps record the X-Men: First Class this weekend, and then possibly upload that file for everyone to see, then you are violating IP law. The proposed technology would prevent you from ever transferring the movie into bits stored on your phone. The same goes for music concerts, except that performers would have to start blasting infrared signals out into the audience for it to be effective. This I'm actually in favor of, because the amount of schmucks holding up an iPhone at concerts has got to be reduced somehow. What happened to actually enjoying the show? What's with all the freaking pictures, people? Another, even wierder possibility is for the iPhone to automatically place a watermark over any image taken, instead of disabling photographs altogether. So you might be able to snap a shot at that Lady Gaga show, but the URL to LadyGaga.com will be emblazoned all over it. Ugh. Now, on the other hand, this tech could be used for good and not for evil, by allowing museums or other landmarks to blast infrared data to the iPhone so that you could get a description of the landscape or historical document you are seeing. Kind of like a digital tour guide without the dirty headset.